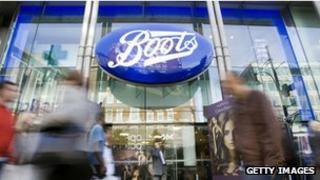 Boots says it is withdrawing from the government's scheme to help the long-term unemployed find work. It comes on the same day that ministers had to drop sanctions from a separate scheme that offers work experience to younger jobseekers. Boots said that it would no longer be offering any new placements on the work programme, because it contained an element of compulsion. State benefits could be cut if people refused to join the scheme. The trade body for the groups delivering the work programme says Boots is the first company to pull out. In a statement, Boots said that some stores had provided work experience placements under the programme to a small number of individuals but as it was company policy never to participate in schemes which compel people to work, "it would no longer be offering any new placements". Kirstie McHugh, head of the Employment Related Services Association, the trade association for the range of organisations that deliver the work programme said she was disappointed. "I think it's a real shame. I think it's a bit of an over-reaction from Boots," she commented. In a separate development, the BBC has learned that one work programme provider, Cornwall Neighbourhoods for Change, has become the first organisation to resign from the scheme. Fees under the work programme are mainly paid out once someone has been in a job for a year, and it is understood that the structure of the scheme made it difficult for them to continue its participation. Clients and staff have been passed over to another provider. Some organisations are also complaining that the number of people being referred to them is simply nowhere near the predicted levels. Jamie Oliver's restaurant in Cornwall, Fifteen Cornwall, which joined the work programme at the outset last June, has not had a single person referred to it, the BBC has learned. It is the second government scheme to tackle unemployment which has run into trouble. On Wednesday, ministers dropped the threat of benefit withdrawal for unemployed youngsters on a work experience scheme. Several companies, including Burger King and Maplin, left the programme which was aimed at providing work experience for 18-24 year olds.